Embark on your next road trip in this triple slide out, cab over bunk 37TS HD FORCE HD motorhome by Dynamax. It features plenty of sleeping options between the king bed, the comfort lounge sofa, and the hide-a-bed sofa, plus the dream dinette can even be transformed into an extra sleeping space. Meal prep will be a breeze in this kitchen and you can store all of your camping goodies inside of the large pantry in addition to a second smaller pantry. When you're ready to relax at night, you can head into the rear private bedroom and watch your favorite movie on the 32" LED TV. If you have an extended vacation, you can choose to add the optional washer/dryer which comes in very handy on those muddy excursions. 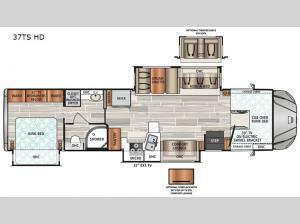 In any Dynamax FORCE HD Super C diesel motorhome, you will surround yourself in refined luxury with the Cherry hardwoods, the contemporary styling, and premium appliances. These motorhomes go beyond what meets the eye with features like the automatic generator start, the 350 HP, and the 1,000 ft- lb. torque. The interiors also provide impeccable features such as the solid surface galley, the Kenwood 7" touch screen dash infotainment system with Apple® CarPlay™ / Android® Auto™ functionality, and the 16 cu. ft. stainless steel refrigerator with an ice maker. 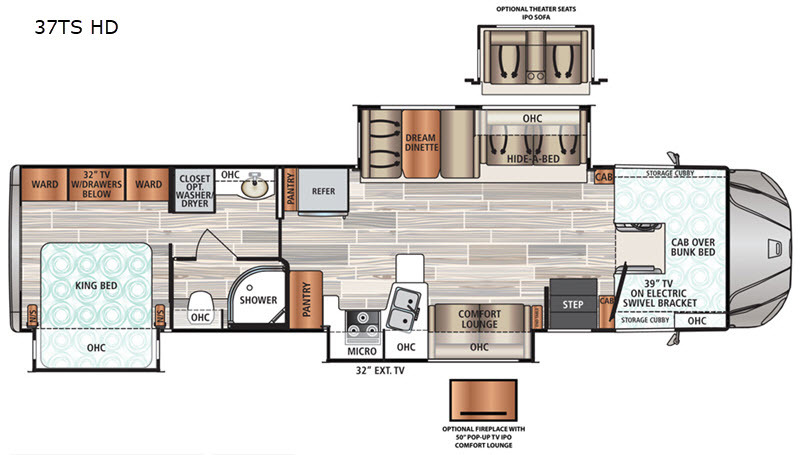 Inside each motorhome you will find casual, easy living interiors with fresh decor options which maximize comfort and value. Throughout the models you will enjoy the premium vinyl flooring as well as the deluxe carpeting with pad, a JBL® 2.1 Sound Bar with Smart Blu-Ray® Player, and LED recessed ceiling lighting. So, come choose the Dynamax FORCE HD model that best suits you and get on the road today!